Sokcho, South Korea is the gateway to the beautiful Seoraksan National Park. Every fall, hundreds of thousands of people flock to Seoraksan to see the leaves changing colors. 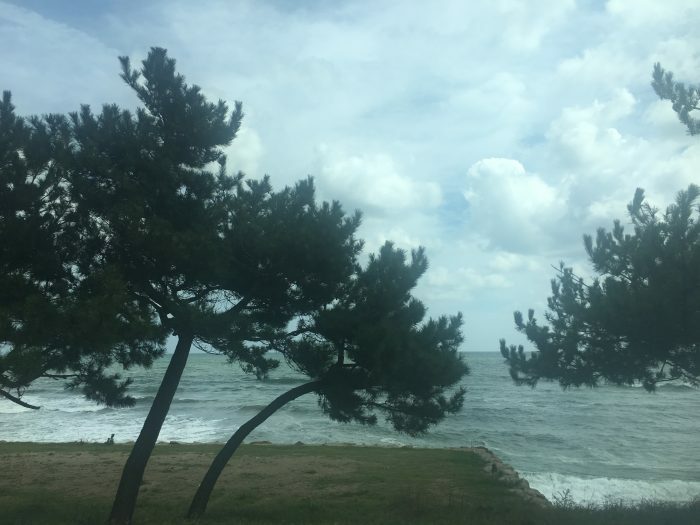 I traveled from Busan to Sokcho by bus as part of the final leg of my trip to South Korea. Since it was a busy time of year in Seoraksan National Park, I had gone to the bus station in Busan a few days ahead of time to buy a ticket. 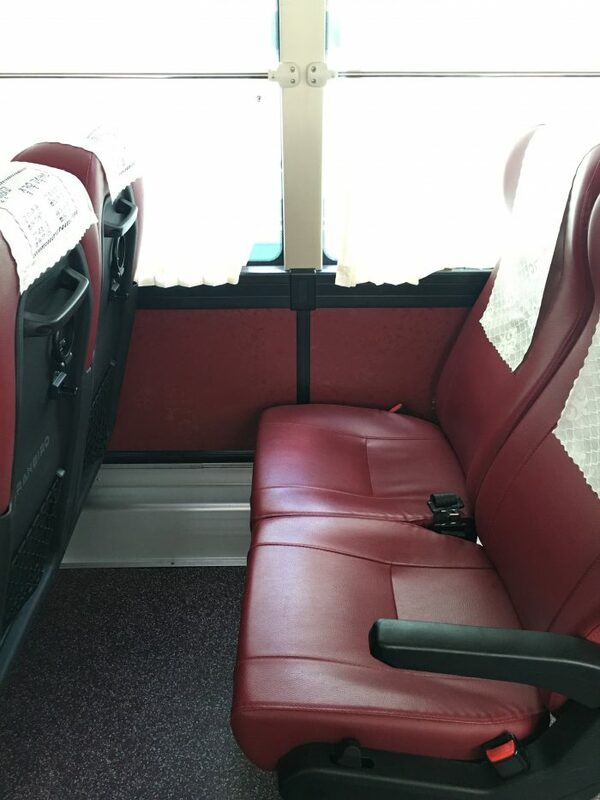 There are only a couple of direct buses from Busan to Sokcho each day. I had to buy the ticket from a ticket window. Despite the woman not knowing much English, I was able to convey what I wanted & got my assigned seat for 41,800 won. That might seem expensive, but there aren’t too many ways to get from Busan to Sokcho directly. 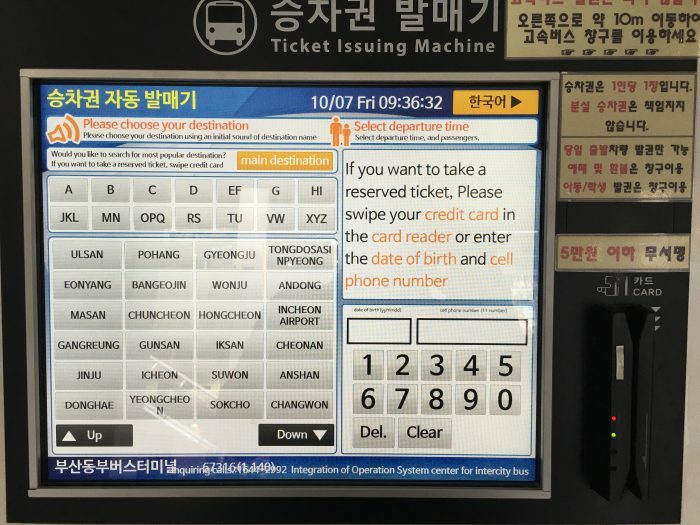 As it turned out, if I had waited until the day of my trip to buy a ticket, I could have purchased it in English from a computerized ticket machine. The machine only sells tickets for that day, otherwise I would have done that in the first place. 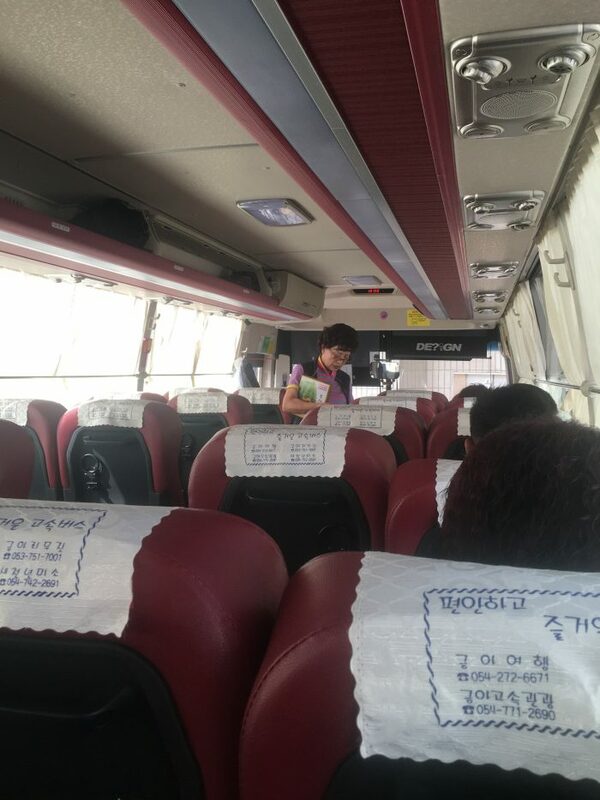 The bus from Busan to Sokcho departed almost empty around 10am. There were perhaps 10 people total. The time I had spent going to buy a ticket ahead of time was completely wasted. Knowing my luck, had I waited, I would have found out the bus was full. A company called Gumabus.com operated the bus. The seats were on the hard side, but there was plenty of legroom. The air conditioning was fantastic. Thanks to the lack of people, everyone was scattered throughout the bus. If you want views of the ocean along the ride, get an assigned seat on the right side of the bus. Right before we left, a woman walked through selling pastries. Once we started, we passed the same construction that I had the previous day on the way from Busan to Gyeongju. This time the driver was smart enough to bail on the toll highway and switch to other roads. We continued on through Gyeongju without making a stop, heading toward the coast instead. I assumed that we were on our way to Pohang, the next large city along the coast. However, we went right around that as well, and continued our journey. I had chosen to take this bus from Busan to Sokcho because it was direct, and I figured it would follow the coast. The journey travels almost the entire length of South Korea. There aren’t any direct trains, so the only other option other than figuring out bus connections would have been to take a train from Busan to Seoul, then take a bus from there, which would have necessitated a subway ride across the city in between. What I didn’t realize was that in addition to being direct & along the coast, there are only a couple of stops along the way. South Korea is serious about their express buses. Apologies for the photo quality, the bus windows were dirty. Passing through Yeongdeok, I spotted a sign labeled “Snow Crab Street”. The town has an important fishing industry, and in fact has a snow crab festival each year. I will have to time my next visit to South Korea for that. 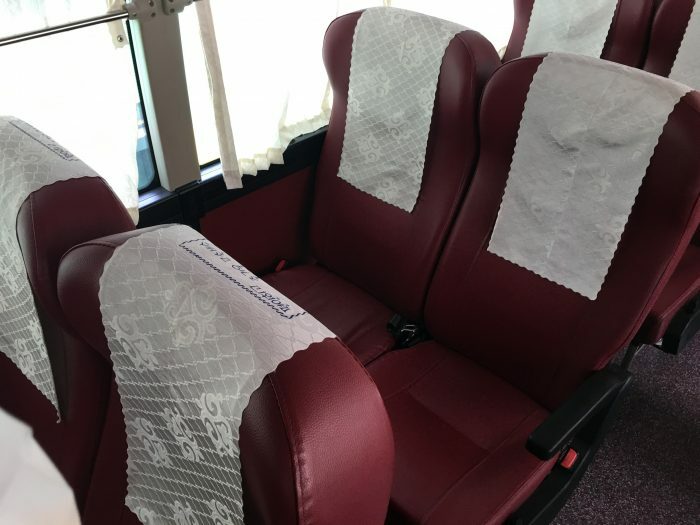 One thing to note about this bus from Busan to Sokcho is that there wasn’t a bathroom on the bus. I found this surprising given the length of the journey and lack of stops along the way, not to mention the demographics of the passengers. I can only assume that the older people either knew not to drink anything or were all wearing diapers, since nobody seemed to mind that we didn’t make our first stop until about 2.5 hours into our journey. When we finally stopped, I didn’t need the restroom or any food. I had brought some pastries from Paris Baguette with me. I did get out to walk around for a bit, staying close to the bus since I didn’t know how long the stop was for and didn’t want to get left behind. It turned out that we stopped for a little over 20 minutes. We then had another long stint on the road, this time about two hours or so. The 10 minute stop was in Gangneung, which is not far from Pyeongchang, host of the 2018 Winter Olympics. 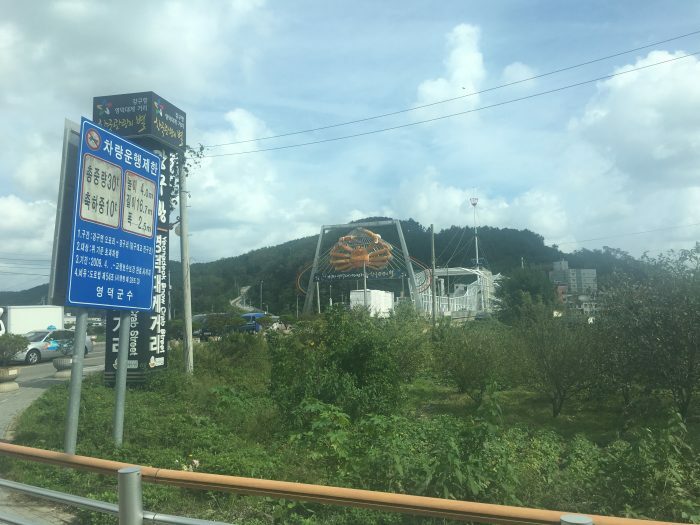 While Gangneung is on the coast, you can see the beginnings of the mountains that will host the games. The skies were getting more and more cloudy as we went further north. One other thing I noticed was that as we headed north, there were more and more military vehicles along the road. This makes sense, of course, since you’re closer to North Korea. There were also a few guys in military uniforms on the bus. Passing through Yangyank, I could finally see the mountains of Seoraksan National Park, where I would be staying for the next three nights. The bus from Busan to Sokcho made excellent time. I had expected that the journey would take 7 hours, but it ended up being less than 6. This is one nice thing about being on express bus. You’re not beholden to much of a timetable outside the couple of stops. One thing to note is that the bus dropped me off at the intercity bus terminal. 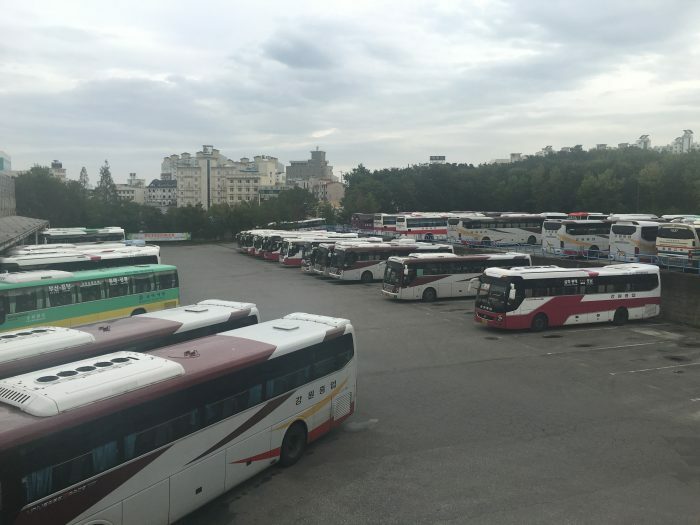 Buses from Sokcho to Seoul depart from a different bus terminal. The intercity bus terminal is more central, but in my case, since I was staying near the entrance of Seoraksan National Park, I had a longer bus ride to my hotel. 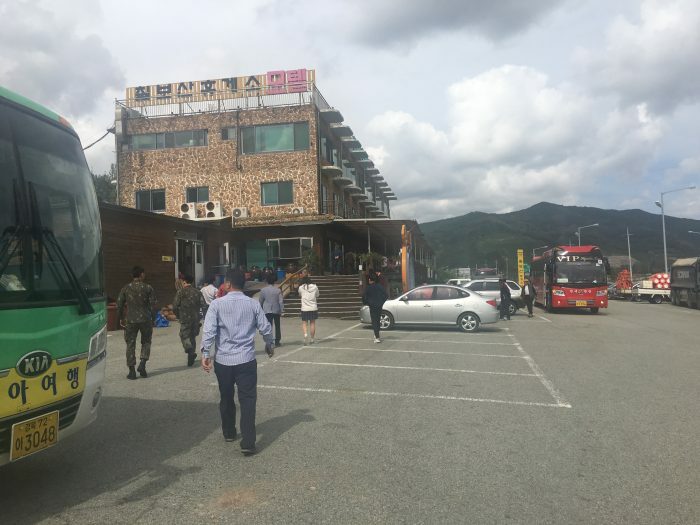 If you’re staying in central Sokcho, then this won’t be an issue for you. Where is the bus final destination in Sokcho? Is it at Sokcho Intercity Bus Terminal or Sokcho Express Bus Terminal. My self will travel to Sokcho in Nov 2017 from Incheon International Airport. My accommodation is a walking distance towards Sokcho Intercity Bus Terminal. Then my next journey would be from Sokcho to Busan. I am still contemplating and researching which route to choose, either by bus direct from Sokcho to Busan, or Sokcho to Seoul (by bus) and to Busan (by KTX Train). Was the bus comfortable enough for 7 to 8 hours journey? The final destination of the bus I took from Busan was the Intercity Bus Terminal. I’m not sure why this was the case, since it was an express bus, but it may be determined by the destination. I found the bus to be comfortable. There were very few people on it, so there was plenty of space. 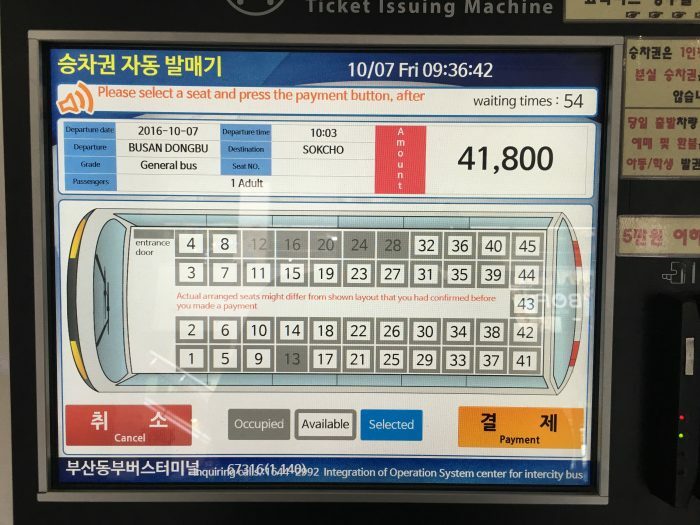 One thing to keep in mind is that if you go from Sokcho to Seoul by bus, then take a train to Busan, you will need to make your way across Seoul to do the connection. Thanks for your input. Great help. The Busan bus station is right near Nopo subway station. so it’s an easy transfer. It’s quite a bit outside of central Busan, but the ride doesn’t take all that long. It’s the first stop of the line too, so you won’t have any issues with crowds & your luggage. Thank you very much. Ok decided to take bus from Sokcho to Busan. 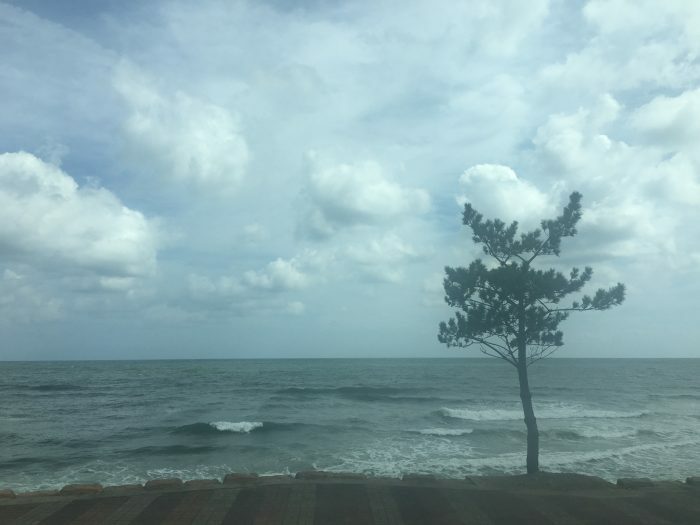 After reading this blog, i made my decision to take a bus from Sokcho to Busan, and i did it on 9th November 2017. 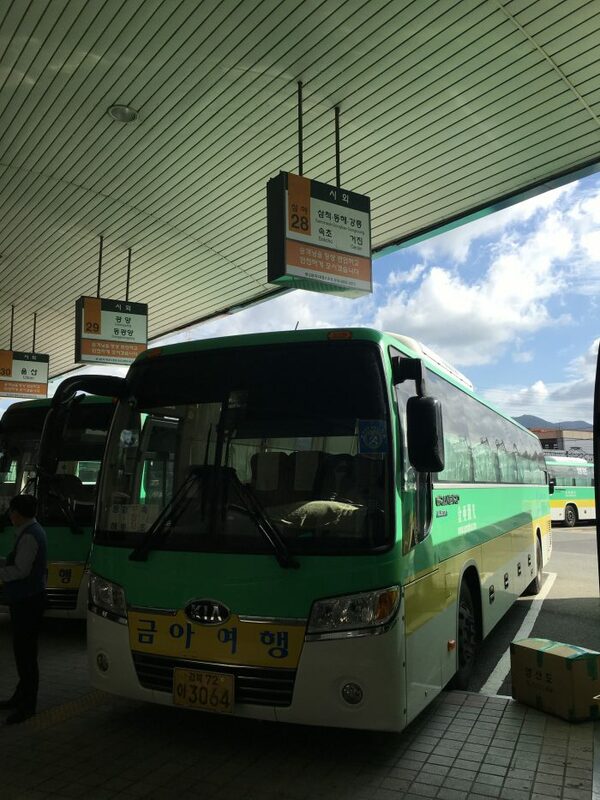 The bus from Sokcho Intercity Bus Terminal 9.30 am and arrived Busan Bus Terminal same place as Nopo subway station around 4.30pm. Then take train from Nopo Station to Jagalchi Station. Thanks. Great! I hope you enjoyed your trip! Salam. Hi! I’m planning to do the same thing as yours. would you mind sharing your experience on the trip to me? I think i don’t want to waste my time travelling back to Seoul. Hi, which bus station were you at in busan when you bought the ticket to sokcho? I was at Busan Dongbu bus station (near Nopo-dong). It’s a little confusing because it also shares the same building as the Busan Central Bus Terminal, so if you see both names, you can at least know that’s the direction to head.